We promise to keep accurate records of where the time is spent and provide you access to these records. We agree to keep you advised of the progress of the project. If we look likely to exceed the agreed budget we will contact you to get your agreement first. This is a service, and unlike our standard products: you are buying time and expertise, not a business outcome. Ultimately the solution outlined here is your very own, that you are paying us to create. We will work to the best of our abilities to produce a solution that delivers what you need while respecting your budget. And more than that: we promise that the time we charge you for will be spent with skill, integrity and care. While we will make endeavours to deliver a working system that meets the plan & proposed budget, there are a number of reasons why this may not happen. Due to changes, unforeseen technical problems, misunderstandings, incomplete information, misaligned expectations, there are cases where the budget may be exceeded or planned features will not be delivered. In these situations: if you want us to continue to work on the project, additional budget will be required. The best way to avoid these problems is to clearly communicate your expectations before agreeing to proceed. Please contact us if you feel there is anything missing. We will prioritise the work to complete the recommendations that we think will provide you with the best return on investment, within your budget. If we make a mistake we will discuss it with you to work out the best way forward. We will never artificially inflate the charges or spend your budget unnecessarily - this is not a “blank cheque”. If you ever have reason to question whether we are meeting our promises, we want to know, so please contact us as soon as possible. We strongly believe that our number one goal as your website designer is to assist you as best we can in developing an extremely persuasive website. Hence, we made this Website Build Process. NOTE: To start the process, the sales handover needs to be completed before we can begin the build process. These times are ONLY indicative, and don’t cover all contingencies, large, or complex projects, or bespoke / customisation projects. Contact us fro more accurate estimates for your specific project. 1.0.1 We strongly believe that our number one goal as your website designer is to assist you as best we can in developing an extremely persuasive website. 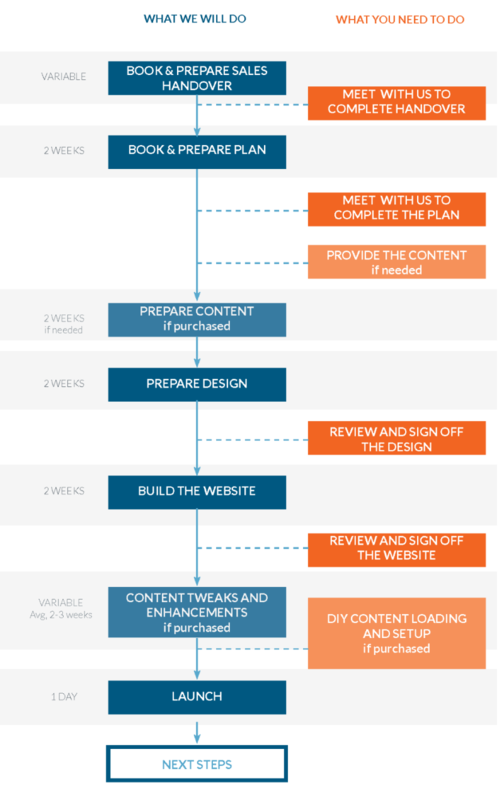 Hence, we made this Website Build Process.